A month ago I posted about G Diapers, HERE. And while I do love the concept of the G Diapers, there were some drawbacks. Namely in the department of super messy grossness. I was having to run loads of laundry like 3 times a day, because Maya was pooping out of them. And I had to keep rewashing the diapers so that I would have clean ones on hand. And three + loads of laundry a day is TOO many. In my mind, it quickly crosses the line from being an eco-conscious decision, to a wasteful one. And I might as well be using totally cloth diapers if I am going to make that commitment. So after a kind e-mail session with a lady over at G Diapers, we determined that Maya was just too small for the size I bought, but bordering on being too big for the smallest size. Her recommendation? Wait until Maya is a bit plumper, then try again. So I still plan to try the G Diapers again when she's a little older. In the mean time, I have been determined to stay eco-friendly in this messy business that is diapering. I don't want to fill up a landfill with diapers that don't break down. Something has come over me. I just can't do it. But I am not enough of a "green mom" to go all the way out and do cloth diapers (not to mention Wes won't even go there). I admire you, green mamas, I really do. So I found a VERY happy solution! Nature Babycare, developed by a Swedish mother that felt like there just HAD to be a better solution for disposable. I am in love with these diapers. They are disposable, but compostable, as well (just like the G Diaper inserts)! The diapers get their absorbency from wood pulp (harvested sustainably from forests in Scandinavia), and are made without oil-based plastics, chlorine, latex, or fragrances. And they make teeny preemie sizes all the way up to training pants. They use gentle earth-friendly processes in the making of the diapers, and they completely break down in less than 10 years. They work just as well as all of the other brands of diapers I have tried. My kiddos no longer have diaper rash, to boot. They aren't as soft as, say, Pampers Swaddlers, but I don't hear my little ones complaining. They have stretchy tabs and a cute leaf pattern on the diapers. Find them HERE. Only problem? They are elusive. So where to get them? Solution: Diapers.com. Spend $50, and you get free 2-day shipping. And in my case, since I live in California, it's overnight shipping! I ordered diapers last night at 5:30 and just had the box delivered to my door at noon today. That's service! I couldn't have made it to the store that fast with both kids in tow today. And if you go to diapers.com as a first time customer, you can get $10 off a $50 purchase with the code: BRANDNEW or AFFL10. And in my household, it's not hard to fill my e-cart to the brim with $50 worth of diapers. Now there is one more problem in this equation. Why use a compostable diaper that breaks down if you don't put it in a biodegradable trash bag? I agree. I was using BioBags (made from corn), but they are a bit unfriendly to the nose when filled with stinky diapers. 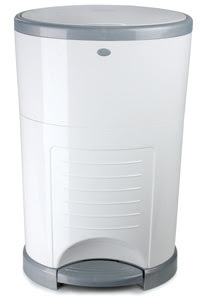 So I actually opted for a Diaper Dekor diaper pail. They are the only diaper disposal system that has biodegradable bags. They are TOUGH, and have a light vanilla (?) smell. So far, so good! I mean, I can't trash Finn's dirty diapers in them (they go straight outside), but that's the case for any diaper pail I've had. Find it HERE. There is also the issue that all these bags of diapers just go into a landfill and don't breakdown anyway. This may be true. But if you live in some Southern California cities (not mine yet, unfortunately) there is a diaper composting service that takes care of this for you. And they use Nature Babycare diapers for their services. It's called Earth Baby, and you can find them HERE. I still feel better knowing that the diapers I am throwing away could break down under the right circumstances. I sleep a little better at night. And if you read this blog even a little bit, you know that is something I need. :) Happy diapering! **Note: One complaint online is that Nature Babycare diaper tabs don't stick to the diaper when wrapping up for disposal. But the tabs stick to themselves! So just wrap it up, and stick one tab over the other. Also, the toddler training pants are a bit bulky and run large. I have decided to stick with the size 5 diapers for Finn. They have a new comfort fit, and fit very well. i feel the same. i want to be eco conscious and yet don't know that i can do cloth. i have cousins who LOVE them, but whatever. other than being super cute i just don't know if i can. i have been receiving G diaper emails for awhile now and thought about using them with the next baby. so glad you are giving helpful reviews. hang in there with the rough schedule. you will make it through. it's refreshing to see a blogger who doesn't make it look as though it's SOOOOOOO easy and they love every minute. i think being a wife and mother is very hard. 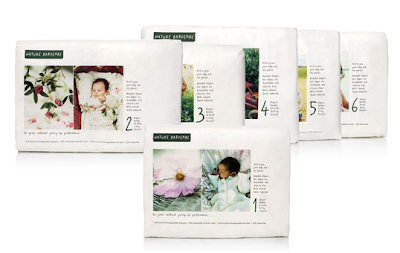 I LOVED the Nature Babycare diapers we used for Cole when he was a newborn. They were actually REALLY absorbent and fit his little tush and skinny legs better than other brands! I do remember the tab issue though, but it didn't bother me. I usually empty the poopy diapers into the toilet first before wrapping 'em up and putting them in the pail or outside. It fixes the smelly issue. These sound great. I am definitely going to try them with our next baby as a newborn. We switched to cloth awhile ago and I really love it- but I don't think I would love it with a newborn. Three loads of poopy laundry does sound like an awful lot- definitely not practical. I think when you decide to delve back in you should try pocket style cloth diapers. These have been my favorite style and we have the "one size" kind so you can adjust the size as they grow. Luthien has the skinniest thighs you can imagine and we have never had a leak! We get them from Happy Heinys and I have been so pleased...just an idea if you want to try again- like you said you might have gone all the way to cloth with that laundry schedule (I only have 13 diapers right now so I am washing once every other day, planning on bumping it up to 18 so I can wash every 2 days). Thanks for the great review, as usual! Love you guys!